2. Q:Can you do OEM business9 Yes, we can do OEM business and we have over 5 years OEM experiences. 3. Q:Can you provide sample for quality reference9 Yes, we do provide samples for our customers. 4. Q:Do you have a quality warranty, how long it is9 Yes, we have a quality warranty for 5 years, we will provide 10 more tubes for each 1000 tubes order to make up the wastage. Haining Grand Solar Water Heater Co., Ltd.
is a professional solar energy product supplier integrating the research, manufacture and marketing. Our company is offering all kinds of solar products, covering solar water heater accessories and solar PVs. As a manufacturer and an OEM factory in China, we offer "one-stop" services when supplying you solar water heaters and solar modules. The selective coating of vacuum tubes converts solar irradiation into heat energy and transfers to copper heat pipes by aluminum wrapping, the heat transfer liquid in heat pipe then vaporize and rapidly rise to the top condenser, in active system, a pump circulates water or heat transfer fluid through the manifold header pipe, taking away the heat to store in tank water, the cooled vapor in heat pipe then liquefies and returns to pipe bottom, waiting for another heat circulation in few seconds. OEM & ODM : We welcome OEM & ODM requirements for solar collector, storage tank, installation frame, and even for some outsourcing equipments; Sample checking : In spite of quality control in production, samples will be selected and installed to check prior to delivery; Minimum order quantity : We offer sample sample manufacturing for customers to check SANENG quality and service; Shipping service : SANENG company offers to arrange goods shipment to abroad ocean port or inland site, and if necessary to make goods insurance, customs clearance, etc; Import certificates : SANENG company offers to make Certific a te Origin CO, FORM A, FORM E, FORM F, customs certification, etc. 5 Remarks 1.Lead-time: 7-15 working days after receiving payment 2.Payment Term: T/T, L/C, Western Union 3. Warranty: 5 Years for the full system, 15 Years for the vacuum tube, and 1 year for accessorie 4. Trade Term: FOB, CFR and CIF 5. 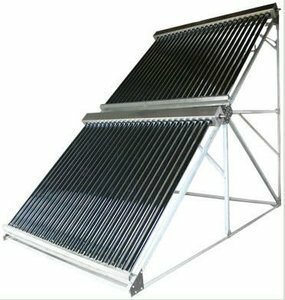 Contact: Ms.
High pressure Solar water heater: Features: 1) The manifold of pressure solar collector is made of red copper and conducted by heat transfer medium liquid. Water can't flow in the vacuum tubes and is operated when confined. The manifold uses aluminum alloy mould material of high strength with airflow design. The liquid in the heat pipe changes into vapour and rises to the condensation end . The transference of heat into the liquid creaters a continuous circulation as long as the collector is heated by the sun. 6. 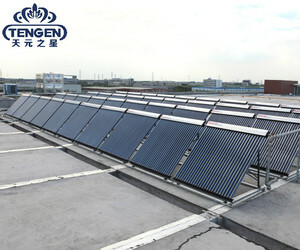 Module design, free combination to meet the demand of large water consumption. 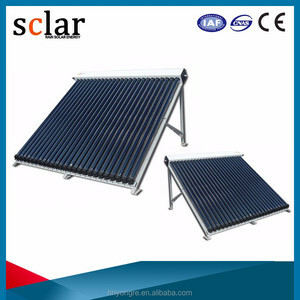 Alibaba.com offers 7,790 vacuum tube solar collector products. About 63% of these are solar collectors, 1% are solar energy systems. 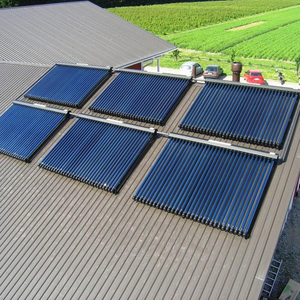 A wide variety of vacuum tube solar collector options are available to you, such as vacuum solar collector, pressurized, and u pipe. You can also choose from copper, glass, and pvc. As well as from water heater, solar thermal, and air conditioning system. 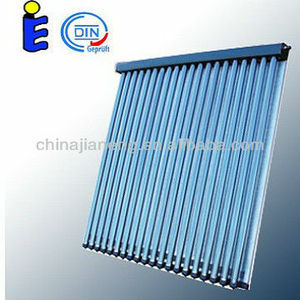 And whether vacuum tube solar collector is free samples, or paid samples. 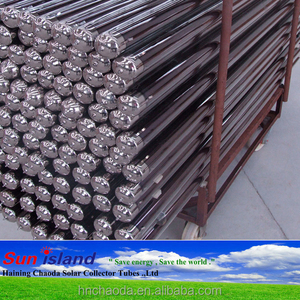 There are 7,688 vacuum tube solar collector suppliers, mainly located in Asia. The top supplying countries are China (Mainland), Turkey, and Taiwan, which supply 98%, 1%, and 1% of vacuum tube solar collector respectively. 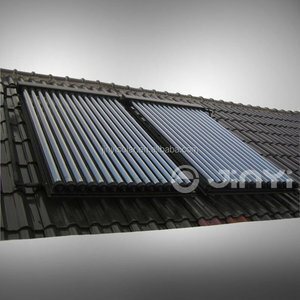 Vacuum tube solar collector products are most popular in South America, Western Europe, and Domestic Market. You can ensure product safety by selecting from certified suppliers, including 7,274 with ISO9001, 2,318 with Other, and 1,465 with ISO14001 certification.